A. An HSA works like an IRA, except that money is used to pay health care costs. Participants first enroll in a relatively inexpensive high deductible insurance plan. Then, a tax-deductible health savings account may be opened to cover current and future medical expenses. The money deposited, as well as the earnings, are not taxable. The funds can then be withdrawn to cover qualified medical expenses tax-free. Unused balances roll over from year to year. A. Everyone (not just self-employed or small businesses) with a qualified high deductible insurance plan is eligible for a tax-deductible HSA. Q. What are some of the main benefits of an HSA? Q. Can I get an HSA with any high deductible health insurance plan? A. No, the plan must meet government requirements to be considered an HSA qualified health insurance plan. Plans that are HSA qualified are typically clearly labeled as such. Get a free quote on an HSA qualified health plan. Q. Are there any first-dollar benefits? A. Many plans offer first-dollar benefits for preventative care, not subject to deductible. These often include things like routine well child visits and immunizations, pap exams, mammograms and PSA exams. Q. Do Rx claims apply toward the plan deductible? A. Yes, for many, but not all plans. Some very inexpensive HSA qualified plans do not allow costs for prescriptions to count towards the deductible, nor are they a covered benefit after the deductible is met. This can be pretty risky, particularly if you develop a condition that requires expensive medication, like cancer. See the plan description to confirm this benefit. Q. What are the tax advantages of contributing to an HSA? A. Contributions to HSAs are made on a tax-deductible basis, meaning you can deduct them from your gross taxable income. You can invest contributed amounts as you choose, and those investment earnings accumulate tax-free until you need the money. Once you decide to make a withdrawal, that’s tax-free too, as long as the funds are used to pay for qualified medical expenses, including health insurance deductibles, most payments for medical services, prescriptions and dental and vision care. For years up through 2010, the penalty for a non-qualified withdrawal prior to age 65 is 10% and the penalty no longer applies after age 65, so you are then free to use your savings as you like. Starting in the 2011 tax year, the penalty for non-qualified withdrawals increased from 10 to 20%. Q. How does the tax reporting work for Health Savings Accounts? A. The IRS requires that banks report HSA activity to you and the IRS. Each year, by the end of May you should receive Form 5498-SA reporting your contributions for the previous calendar year. This allows any contributions made after January 1st for the previous tax year to be included. Remember that contributions can be made until April 15th or the business day following, for the previous calendar year. If you made distributions in the previous calendar year you will receive a form 1099-SA. Q. What will the maximum contribution limits be in 2018? A. Annual contribution limits for 2018 will be capped at $3,450 for an individual or $6,900 for a family. Q. What are the maximum contribution limits in 2017? A. Annual contribution limits for 2017 are capped at $3,400 for an individual or $6,750 for a family. Q. What were the maximum contribution limits in 2016? A. Annual contribution limits for 2016 were capped at $3,350 for an individual or $6,750 for a family. Q. What were the maximum contribution limits in 2015? A. Annual contribution limits for 2015 were capped at $3,350 for an individual or $6,650 for a family. Q. What were the maximum contribution limits in 2014? A. Annual contribution limits for 2014 were capped at $3,300 for an individual or $6,550 for a family. Q. What were the maximum contribution limits in 2013? A. Annual contribution limits for 2013 were capped at $3,250 for an individual or $6,450 for a family. Q. What were the maximum contribution limits in 2012? A. Annual contribution limits for 2012 were capped at $3,100 for an individual or $6,250 for a family. Q. What were the maximum contribution limits in 2010 and 2011? A. Annual contribution limits for 2010 and 2011 were capped at $3,050 for an individual or $6,150 for a family. Q. What were the maximum contribution limits in 2009? A. Annual contribution limits for 2009 were capped at $3,000 for an individual or $5,950 for a family. Q. What were the maximum contribution limits in 2008? A. Annual contribution limits for 2008 were capped at $2,900 for an individual or $5,800 for a family. Q. What were the maximum contribution limits in 2007? A. Annual contribution limits for 2007 were capped at $2,850 for an individual or $5,650 for a family, even if your deductible is less! Q. If I get an HSA plan and am 55 years old or older are there any special “catch up” benefits? A. Yes, in addition to the normal contribution levels HSA’s have “catch up” provisions. Catch up contributions for individuals who are 55 or older are $1000. Historically, they increased from $700 in 2006 to $800 in 2007, to $900 in 2008 and to $1000 in 2009 and for all subsequent years. Q. If both spouses are 55 and older, can both spouses make “catch-up” contributions? A. Yes, if both spouses are eligible individuals and both spouses have individually established an HSA, each in their own name. If only one spouse has an HSA in their name, only that spouse can make a “catch-up” contribution. Q. If I get a qualified HSA health insurance plan and HSA mid-year how are HSA contributions pro-rated? A. Individuals who are eligible individuals on the first day of the last month of the taxable year (December for most taxpayers) are allowed the full annual contribution (plus catch up contribution, if 55 or older by year end), regardless of the number of months the individual was an eligible individual in the year. For individuals who are no longer eligible individuals on that date, both the HSA contribution and catch up contribution apply pro rata based on the number of months of the year a taxpayer is an eligible individual. If a contribution exceeds the pro-rata amount you must maintain HSA eligibility for the next calendar year or the contribution exceeding the pro-rata limit becomes taxable and the 20% additional tax rule for premature distributions will apply. Q. Does the account need to be funded before year-end? A. You have until the tax-filing deadline of the following year to make a contribution for the previous tax year. Q. Do my HSA contributions have to be made in equal amounts each month? A. No, you can contribute in a lump sum or in any amounts or frequency you wish. However, your account trustee/custodian (bank, credit union, insurer, etc.) can impose minimum deposit and balance requirements. Q. Can medical expenses incurred before the HSA was established be paid from the HSA? A. Individuals who establish an HSA on or before April 15, 2005 can use the HSA to reimburse qualified medical expenses incurred on or after the later of: 1) January 1, 2004; or 2) the first day of the first month that they are covered under an HDHP. For HSAs established after April 15, 2005, medical expenses may not be paid from an HSA if the expenses were incurred before the HSA was established. Q. Can I claim both the “above-the-line” deduction for an HSA and the itemized deduction for medical expenses? A. You may be able to claim the medical expense deduction even if you contribute to an HSA. However, you cannot include any contribution to the HSA or any distribution from the HSA, including distributions taken for non-medical expenses, in the calculation for claiming the itemized deduction for medical expenses. Q. 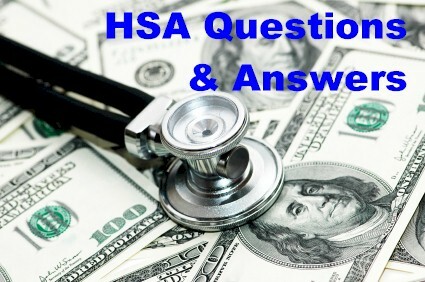 Can I use the HSA funds for my spouse or dependents? A. Yes, withdrawals from HSAs are tax-free if they are used to pay for qualified medical expenses of the account holder, his or her spouse, or dependents. Q. What is the penalty for non-qualified withdrawals before age 65? A. The penalty for a non-qualified withdrawal prior to age 65 is 10% up through the 2010 tax year and 20% for 2011 and later and the penalty no longer applies after age 65 so you are free to use your savings as you like. Non-qualified withdrawals are taxable both before and after age 65. Withdrawals from HSAs are tax-free if they are used to pay for qualified medical expenses. Q. Can people decide to have his/her HSA custodial account administered by a bank/institution of their own choosing? A. Yes, you can have a qualified medical plan and decide to have his/her HSA account with another HSA administrator. Q. Can a Medical Savings Account be rolled into a Health Savings Account? A. Yes. MSAs can be rolled into HSAs on a tax-free basis, but it is not necessary. If, however, you choose to participate in the new HSA contribution limits and deductibles at this time, complete an HSA Adoption Agreement. Q. What happens under the HSA law once someone becomes eligible for Medicare? A. Once a person becomes Medicare eligible, he/she can typically no longer contribute to an HSA. However, he/she can use the accumulated funds to cover qualified medical expenses not covered under Medicare or his/her supplemental plan. Q. Since deposits can be made by anyone on behalf of the account beneficiary, who can legally take the tax deduction? A. Contributions made by a family member on behalf of an eligible individual to an HSA are deductible by the eligible individual in computing adjusted gross income. Q. Are health insurance premiums considered a qualified medical expense? A. No, health insurance premiums are not qualified eligible expenses except for the following scenarios: qualified long term care insurance, COBRA and health care coverage while receiving unemployment compensation. Funds can also be used to pay for Medicare Part A or B premiums, but not Medicare supplement premiums. However, these regulations may loosen up in the future with the health insurance reform movement. Q. Who can deduct premium payments from their taxes? A. Today, the self-employed can deduct their premiums. We are hoping Congress will pass legislation that will allow everyone to deduct 100% of their premium payments. Until such legislation is passed, only the self-employed can their premium payments. Q. If a client files an extension on his/her taxes, would he/she have extra time to contribute money into his/her HSA custodial account? A. The client could contribute until the tax filing deadline. An extension does not affect the amount that a client can contribute to the HSA. Q. Can clients roll funds from an IRA or 401k into an HSA? A. You cannot directly roll funds in a 401(k) or other retirement plan into an HSA. You can withdraw funds from one of these accounts, pay applicable taxes (and penalties) on the amount you withdraw, and then use the remaining funds to make a contribution to your HSA. However, the amount you contribute to your HSA is still limited by the annual contribution limits. For 2007 and forward, you may make a one-time transfer for IRA funds to an HSA. The amount of the IRA transfer reduces your HSA contribution for the year. If you fail to remain an eligible individual for 12 months after the month of the transfer, the amount of the transfer is included in income and subject to a 10 percent additional tax. Consult with your tax professional before doing this for your own protection. Q: If an unmarried insured has single coverage, can HSA funds be used to pay for qualified medical expenses for his/her dependents? Q. Can minors have a “self-only” HSA? A. According to the Treasury guidance, minors who are claimed as a dependent on another person’s tax return are not eligible to have a “self-only” HSA. They can be covered by their parent’s or guardian’s HSA plan. Q. Does a person buying an HSA need to have “earned” income in order to deduct the contribution? Can they deduct it against “unearned” income i.e. pension, investment, etc. A. An individual who has less earned income (even no earned income) than his/her HSA contribution may still take the full above-the-line deduction. A. No one insurance company is the best in all situations. Things like age, zip code, tobacco use and health history will influence which plan will be best for your specific needs.